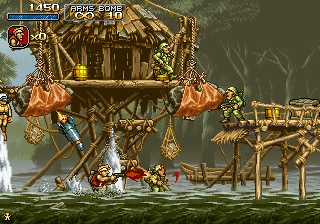 All graphical content (c) Nazca Corp., SNK and PlayMore. Using rips by (in no particular order): Gussprint, The Mad Soldier, Random Rebel Soldier, C2000MC/Futaokuu, Random Talking Bush, Kevin Huff, Grey Wolf Leader, Goemar, Magma Dragoon, AzRaezel/Dan, The_Protagonist, Tk big_mickey_k, Grim, @$$h0l3 (what a nickname is that!? ), Crazy Slug, Xezan... and some 'unsigned' rips. Hope I'm not forgetting anyone. 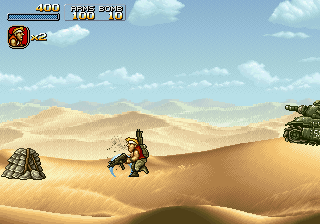 Now with music, using ST-Sound by Arnaud CARRE a.k.a Leonard/Oxygene (http://leonard.oxg.free.fr). - On the main menu, F1 to switch: 1 credit / 3 credits / infinite credits. Attention though, this doesn't work ingame on purpose. - Up, down, left, right: Move. 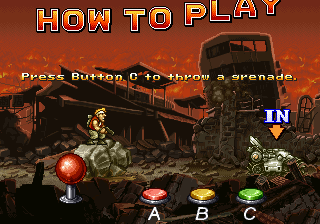 - Down + Button X to exit a vehicle. Press "Start" in-game to bring a Menu to pause/quit game. Using F9/F10 switches betwen different video modes, but using Notaz highly acclerated SDL, you won't see many differences. And now featuring Compo4All. Normal version still (without C4A) also inside PND. 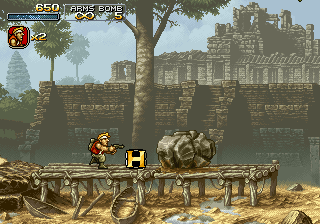 It's a tribute to the Metal Slug Serie from ClÃ©ment CORDE. 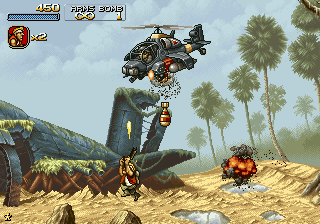 It is a game composed of 3 Missions (each mission divided into a number of levels). The first mission is similar to the serie, then it forks and offers some refreshing gameplay (find the submarine in mission two if you can!). But first mission alone will not be easy to complete ! * No error message for now, all failure to upload score will be silent. * No Hiscore reading within the app, you must go to website to see leaderboard. * Corrected the nomusic executable (thanks ClÃ©ment). Amazing how this has been done. Thank you. 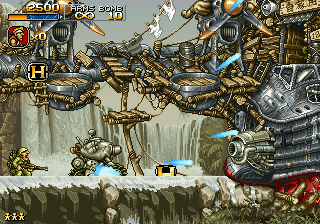 Very polished game with great graphics and different interesting vehicles. Very hard though, so good to have infinite credits :). Feature request: option to save the game at some points (at least between missions).